Located in Thunder Bay, Ontario, Vanderwees Garden Gallery is proud to provide you with a totally unique shopping experience! 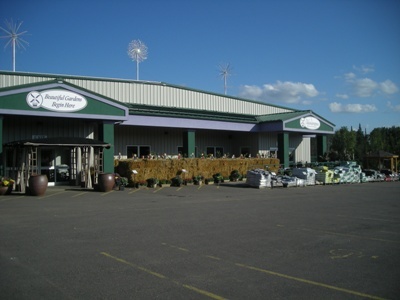 With over 100,000 square feet of retail space, we carry an enormous selection of trees & shrubs, annuals & perennials, vegetables & herbs, water gardening supplies, and much more! Plus, visit our greenhouses and see our selection of thousands of tropical houseplants for your home or office. We’re much more than just a Garden Centre. Visit our gift shop and you’ll find something for everyone, including yourself! We offer everything from home decor to patio furniture, and gourmet foods to Crocs! While you are here, stop by our Tulips Cafe for a delicious, homemade lunch, made with ingredients from our own gardens. Worried the kids will be bored? Bring the whole family to our family fun centre with mini golf and an animal farm! We hope to see you soon! We know that you love to get out in your garden as soon as possible, which is why we bring in over 2,000 seed packets starting in February every year. You’ll find your favourite annuals, perennials, vegetables and herbs, as well as varieties you’ve probably never heard of. Our garden centre also carries all of the pots, trays, potting soil, fertilizer, planting supports, row cover, and other gardening supplies to help your garden get off to the best possible start. Quick Fact: Read the back of your seed packets carefully for info on when to start your plants. Our last frost of the season is typically the first week of June, however, plants can be moved outdoors sooner provided that they are protected with frost blankets. If your seed packet says to start 30 days before the last frost, then start your seeds at the end of April, or beginning of May.